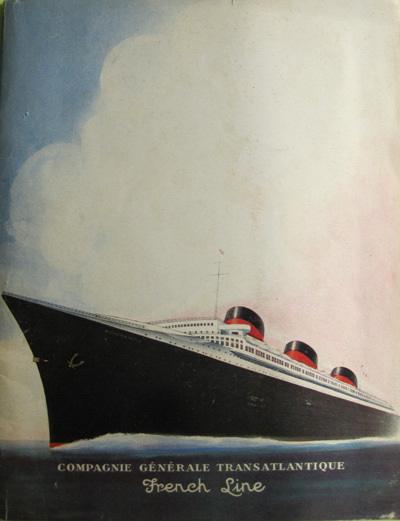 ← BOOKS—WHERE ARE THEY GOING? Not that long ago, if you were contemplating a trip—say, at Christmastime—you wouldn’t Google destinations and then take a virtual tour through a prospective hotel room. 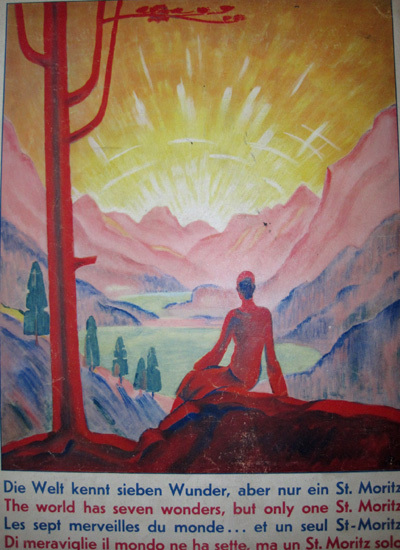 No, you’d go to a travel agency where there would be walls full of yummy brochures suggestive of the poetry that awaits you. 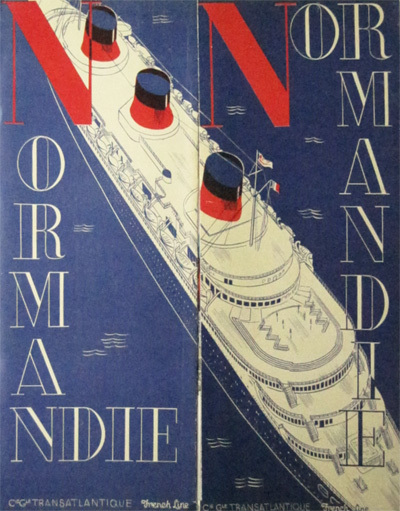 Beginning with the most awesome (a word, for once, appropriate) instance of travel promotion in booklet form, namely, the great Paul Iribe’s evocation of the instantly legendary cruise ship, Normandie, in 1935, seems the best way to introduce the imaginative priorities of travel phenomena of the not-so-distant past. 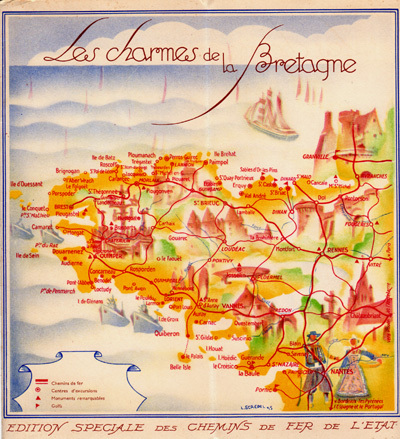 This classic includes a commentary, stating, “Masterpiece of French Technology and Art,” thus ushering us into not merely a means to get somewhere, but an immersion in groundbreaking elegance and discovery. 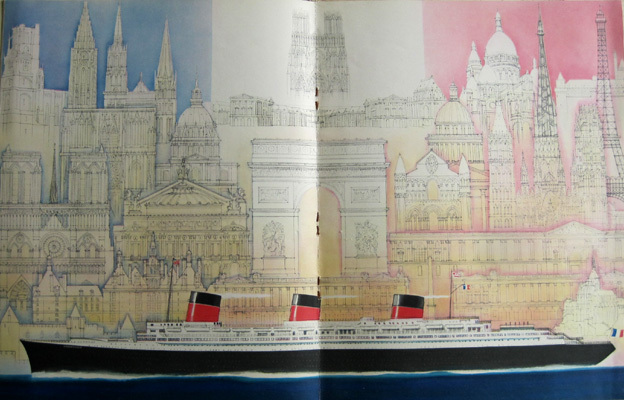 A more typical handout for prospective visitors to that ship is this fold-out, well conceived by art deco graphics specialist, Libis. 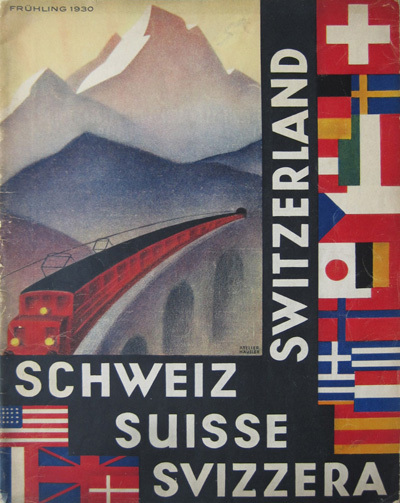 “The world has seven wonders but only one St. Moritz,” purrs the back cover of this 1930 enticement to visit Switzerland. 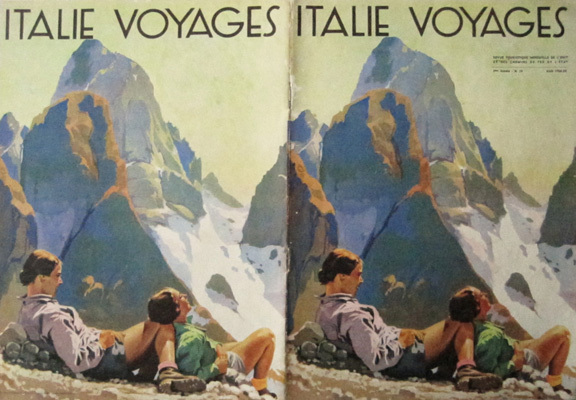 Short and sweet, and acutely aware of the powers of scale in graphics, this 1934 promotion booklet for travels in Italy performs an arresting take-off with its brilliant covers. 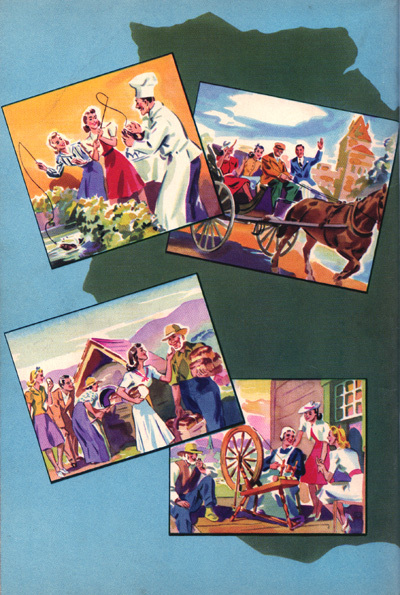 “Have you ever had a French Canadian vacation” chirps this pert little vehicle aimed at the US market right after World War II. 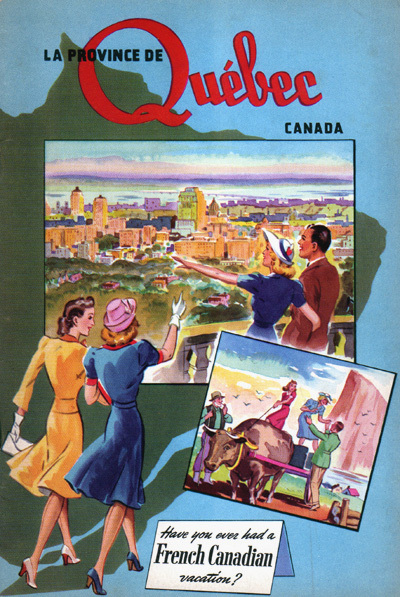 There the visual strategy was to assure North American Anglos that, though foreign, Quebec fitted right into mainstream priorities. 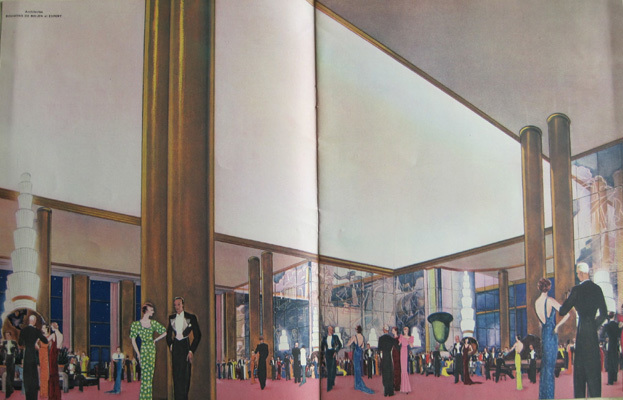 On the other hand, in the 1935 glorious fold-out for Brittany, the non-suburban demands of art deco (produced by desinger, L. Screpel) are at high tide, in an effort to jazz up a too-authentic-for-its-own-touristic-good photo documentation. 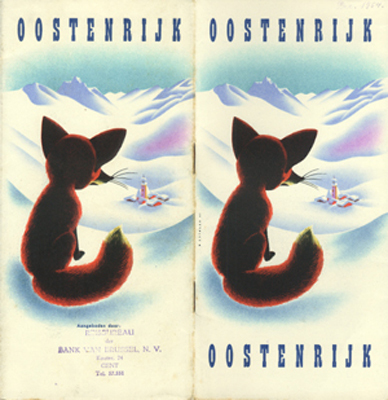 In this farewell stop of our own whirlwind traverse, the charming illustration has been actually augmented, in its task of bringing tourists to Austrian winter sports destinations in 1954, by very accomplished photos, especially alert to the nuances of snowscapes and apres-ski haunts. 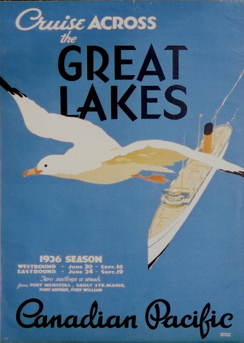 This entry was posted in Art Deco Posters&Graphics, Current Events, Illustration Art, Illustrators, Poster&Graphic Art, Poster&Graphic Artists and tagged Canadian travel, European travel, Paul Iribe, travel, travel brochures. Bookmark the permalink.